The Dark Knight Rises is one of the most beloved superhero movies out there. And soon, Knight Models will be bringing all its action to the tabletop. 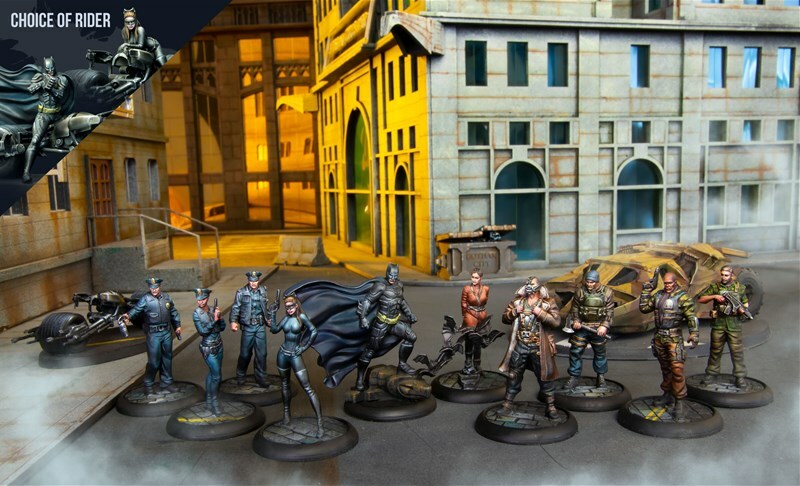 They are coming out with a The Dark Knight Rises starter box for their Batman Miniatures Game. They're showing off the contents, if you wanted to have a look-see. The Dark Knight Rises is one of the most thriller and nerve wracking stories among the Nolan’s Batman Trilogy. After the attack in Stock Exchange in Gotham, Bruce offered the Clean Slate program to Selina in exchange for providing information regarding Bane and his mercenaries to his powerful friend. Selina agreed upon her immunity for her past crimes and took Batman to the underground tunnel where bane and his mercenaries have been. They take out a couple of mercenaries on the way to Bane. But the Cat was only trying to save her life from Bane and hence betrayed Batman. After that Bane captured him and told his plans in Gotham to fulfill Ra's al Ghul's destiny of destroying the city. Batman wasn't going to accept this and a lengthy battle of hand-to-hand combat between the two started. As Bane was also from the League of Shadows, Bruce appears to be more aggressive and offensive than his usual sense due to the strength of his opponent. But the lack of practice and poor recovery from the past injuries, Bane was able to defeat Bruce finally and broke his backbone. Batman has also tried several diversions like flash bangs and disabling the lights which prove useless against a trained League of Shadows member like Bane. After a ruthless fight, Bruce got injured and gets laid on the floor with the pain of his broken body. Then Bane wanted to reveal the truth about his base in Gotham and asked for a detonator. He pressed the detonator to explode something and suddenly the Bat Tumbler falls through the ceiling. Yes, Bane has set up his base underneath Wayne Enterprises' Applied Sciences office because he wanted to use Wayne's resources against the city of Gotham.